Beazley PLC is a leading international insurer which specialises in insurance policies that are complex and bespoke. I added it to the model portfolio in 2015 because it was a good company trading at a reasonable price. I decided to sell because the share price has almost doubled, leaving the shares close to “fair value”. As a specialist insurer, Beazley doesn’t write many “cookie-cutter” policies such as car insurance or home insurance. Instead, it covers a diverse array of risks, from celebrity weddings to supertankers and kidnapped CEOs. However, unlike many of the companies I invest in, Beazley wasn’t facing any valuation-depressing difficulties at the time of purchase. Everything seemed to be ticking along nicely and the company’s valuation wasn’t obviously cheap (the dividend yield, for example, was just 2.8%). Given this not obviously cheap valuation, my hope was that Beazley would continue to grow at something like 5% to 10% per year and that – for one reason or another – Mr Market would become enthusiastic about the company and offer to buy my shares at a much higher price. Note: If you’d like to read the full pre-purchase review (taken from the September 2015 issue of my monthly newsletter) you can download it here (PDF). What do I mean when I say Beazley had all the features I look for in a good company? For a start, it had a long history of above average growth, measured across net asset value (insurance companies don’t have “revenue” as such, so I look at their net assets instead), earnings and dividends. This growth had taken the company from the proverbial “broom cupboard” in 1986 to a company generating more than a billion pounds of insurance premium every year. Beazley was also more profitable than average. My usual measure of profitability is a company’s ten-year average return on capital employed (ROCE), but that doesn’t work for banks and insurance companies. Instead, I use two metrics: Ten-year average return on equity (ROE) and five-year average combined ratio. The median ten-year ROE for insurers on my stock screen is 11%, which is pretty close to the average ROCE for non-insurance companies. Beazley’s ROE was comfortably above that level at just over 18%. This is important because consistently high profitability is what you’d expect to see from a company with strong competitive advantages, and strong competitive advantages are what a company needs if it’s going to keep growing at a good pace far into the future. Whereas return on equity looks at returns (profits) relative to equity (book value or net assets), the combined ratio looks at premium income relative to the combined cost of claims and other expenses. It’s a useful metric which can highlight insurers writing insurance at a loss just so they can get their hands on the premiums. Those premiums are then invested with the goal of generating enough investment return to more than offset the underwriting (i.e. insurance) losses. It’s a risky strategy that does not have a good track record, but it’s an easy way to create the illusion of growth and that’s why many insurers go down that route. A profitable underwriting business will have a combined ratio of less than 100% (i.e. claims and other expenses are less than 100% of premiums earned), so I look for a five-year average of less than 95%, which is surprisingly difficult for many insurers to achieve. In Beazley’s case, it had achieved a fairly steady average of 90%, so the company was clearly doing something right. It also had a strong balance sheet, with little in the way of operational borrowings and a healthy premium to surplus ratio. If you haven’t heard of that ratio before, it’s the ratio between premiums earned and tangible book value (the “surplus” of tangible assets over liabilities). A general rule of thumb is that earned premiums should be less than twice the company’s net tangible assets. This suggests the company is writing a prudent amount of new business relative to the balance sheet’s ability to absorb claim losses. Beazley’s five-year average premium to surplus ratio was just 1.6, suggesting a prudent level insurance was being written. 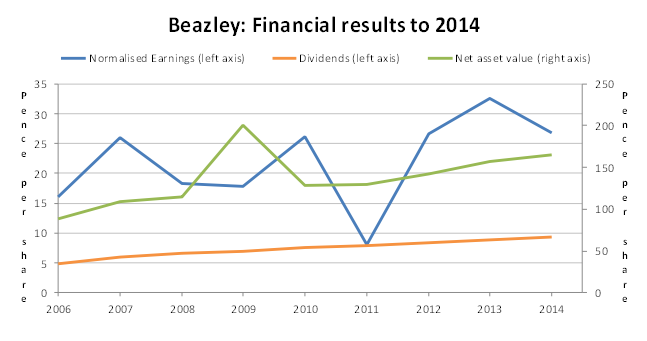 So Beazley had a good track record of growth and profitability, as well as a strong balance sheet. But what happened after it joined the portfolio? The answer, for the most part, was business as usual. For example, in 2015 the company produced solid growth in net assets, premiums and profits, and increased the dividend by 6%. The dividend was further bolstered by a special dividend that Beazley occasionally uses to return excess capital to shareholders. In 2016 that story was repeated. Net assets and profits increased while the dividend was raised by 6%. And another special dividend was paid, which was a welcome bonus. Just as importantly, profitability remained extremely good, with the combined ratio coming in consistently below 90%. For me the most interesting aspect of this period was Beazley’s ability to shift its insurance focus from one area to another, depending on the expected risk-adjusted returns that were available. As a group of diverse insurance businesses, Beazley was able to reduce the amount of new insurance written in, say, commercial property or reinsurance, where expected risk-adjusted returns were low, and write more insurance covering professional indemnity, management liability and large scale cyber risks, where expected risk-adjusted returns were higher. Unlike 2015 and 2016, 2017 was a year characterised by an unusual number of large natural catastrophes. This affected Beazley primarily through its catastrophe reinsurance business, which provides insurance to other insurance companies so that, for example, they don’t get wiped out when a hurricane flattens hundreds of homes which the other insurer had written home insurance policies for. 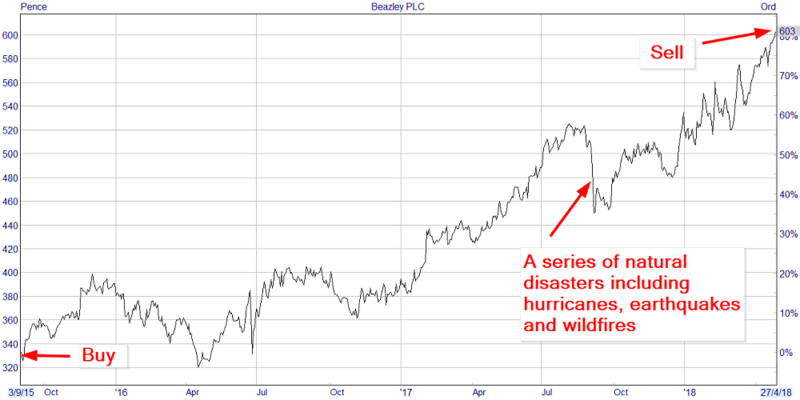 For Beazley, the most important catastrophes of 2017 were multiple hurricanes in the US Virgin Isles, wildfires in California and earthquakes in Mexico, with a total cost to Beazley expected to be in the region of $200-$300 million, which is pretty much a full year’s profit. 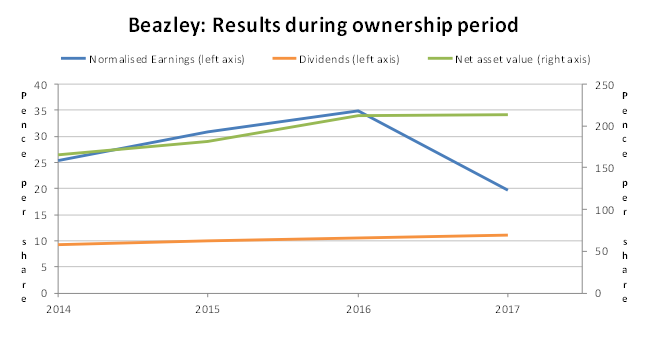 Despite this, Beazley remained profitable in 2017 in both underwriting and overall terms. The company also reiterated that exposure to this level of natural disaster is an inevitable feature of its business and as such, much time is spent designing the business to survive and even thrive under these conditions. How can an insurance company thrive when disaster strikes and millions has to be paid out to claimants? The answer is that disasters almost always lead to higher premiums. For Beazley, this should create more opportunities to write more insurance at rates which are more favourable than they have been for many years. Beazley wasn’t obviously cheap when it joined the portfolio. Its dividend yield was below the market average at just 2.8% and its PE10 ratio was above the market average at 15.2. However, its high growth rate and good profitability were enough to make that valuation appear attractive. Today, after share price gains of more than 80%, Beazley’s dividend yield is below 2% and its PE10 ratio is considerably higher at 24.2. However, its growth rate and profitability are about the same, which means the price is not nearly as attractive. In fact, I’d say the current price is probably quite close to fair value. For example, with a growth rate of around 6% and a dividend of around 2%, Beazley has an expected return under the dividend yield-plus-growth model of 8%. That’s very close to the 7% or so annualised return you might reasonably expect from the stock market; therefore Beazley is currently close to fair value. The company is also ranked 99th on my stock screen. That’s fairly close to the mid-point of 107 and I sometimes use a stocks’ proximity to that mid-point as a proxy for how close or far it is from fair value. So with Beazley probably close to fair value, I saw no obvious reason to hold onto it. I like the company, I’d be happy to invest in it again, but at its current price my expectations for its future returns are about average and I’m aiming at something more than average. That’s why I removed Beazley from the defensive value portfolio and my personal portfolio earlier today and, as usual, the proceeds will be reinvested into a new and hopefully equally successful holding next month. You can read the full pre-purchase review of Beazley in the September 2015 issue of UK Value Investor here (PDF). You can also read other company reviews in the sample newsletter archive. John, a very interesting article, particularly for me as i work in the Lloyd’s market. Beazley are without doubt one of the top Syndicates, but the entire global market (not just Lloyd’s) is currently struggling with high claims, and a worryingly significant amount of excess capacity, which is suppressing premium rates to an unhealthily low level. I think for rates to rise back to acceptable levels (i.e. capacity to leave the market), it will take a significant event, say a cat loss or losses totalling in excess of $250bn, a large stock market crash, some sort of global disaster, or for all the capacity to suddenly find a more attractive place to invest. Mergers and takeovers continue to occur, and Beazley are an obvious name to potentially be acquired. I have considered buying shares in them myself for this reason, but as you point out they have risen significantly in recent times, so any upside here may be limited. Regardless, they’re a well run professional outfit that should be around for years to come, either under their current structure, or maybe as part of a bigger organisation. Hi Kid, thanks for the thoughtful comment; it’s always nice to get the view of an industry insider. I’m no expert, but the ‘excess capacity’ issue seems to be a consequence of the post-QE low interest rate world. Capital is hunting around looking for a better yield, and one of the areas it’s found is catastrophe insurance (and I guess other kinds of insurance as well). I think the shift towards using more institutional capital in the insurance industry is structural, but the current degree of excess is probably cyclical. As you say, a year or three of back-to-back mega-catastrophes will probably push the reset button on how attractive the sector is. But in lieu of that, Beazley have shown an ability to be very wise in their insurance writing and capital allocation activities. As for a potential takeover, acquirers are often willing to pay a very high price, so even after Beazley’s recent run up a bid could be put in 30% or 50% higher than today’s price (or more). That would be nice but is, of course, entirely uncertain. Enjoyed the article and in particular the ironic piece on Neil Woodford, timely and relevant given that more of us are allotting more space to passive trackers. I have a question and thought I would ask you, although I am not a paid member. When companies refer to ‘in line with market expectations’ or ‘below market expectations’ at trading updates, interims or fy, what set of figures are they referring to, and how would I find them? There used to be a Company Refs book which was annual as I recall. Is there another source? One or two companies do include an analyst research in the investor relations, though rarely and usually from the house brokerage. Any info would be appreciated. Looking forward to next article. So the ‘market expectations’ that companies are talking about are probably something similar, i.e. the consensus (average?) values from analysts/brokers/etc. Unfortunately I couldn’t find any free source for forecasts or consensus views (other than for share prices). Thx for info. Reuters do have rev and eps forecasts collated from analysts. Not detailed and cumbersome to navigate but ok.
I’ve got Beazley shares, I started buying them after Brit Insurance which I used to hold got taken over around 2013. I always like to hold an insurance company after reading about Warren Buffet’s investment strategy. I guess I’ve done rather well with them, I first bought at £1.88 then £2.37 and lastly £2.79 in 2014. Now they are at £6 but I wasn’t thinking of selling since my capital gains are going to be at the limit for this year with the other takeovers scheduled. As a rule I don’t sell unless I’m forced to by takeovers or personal capital gains tax issues. I choose to live with my investment decisions however they turn out, good or bad. Hi KayD, thankfully all my investments are in tax wrappers, so capital gains is one issue I don’t have to think. If I did it would certainly make my sell decisions more difficult and a buy and hold strategy more attractive. In fact, I think capital gains is one of the reasons why Buffett switched his holding period to “forever” for a big chunk of his portfolio. Basically, the longer you can compound at decent rates of return while avoiding capital gains tax, the better.